This map shows the metropolitan Detroit area that is relevant to the discussion of the Indian trading, slavery and burials in this article. 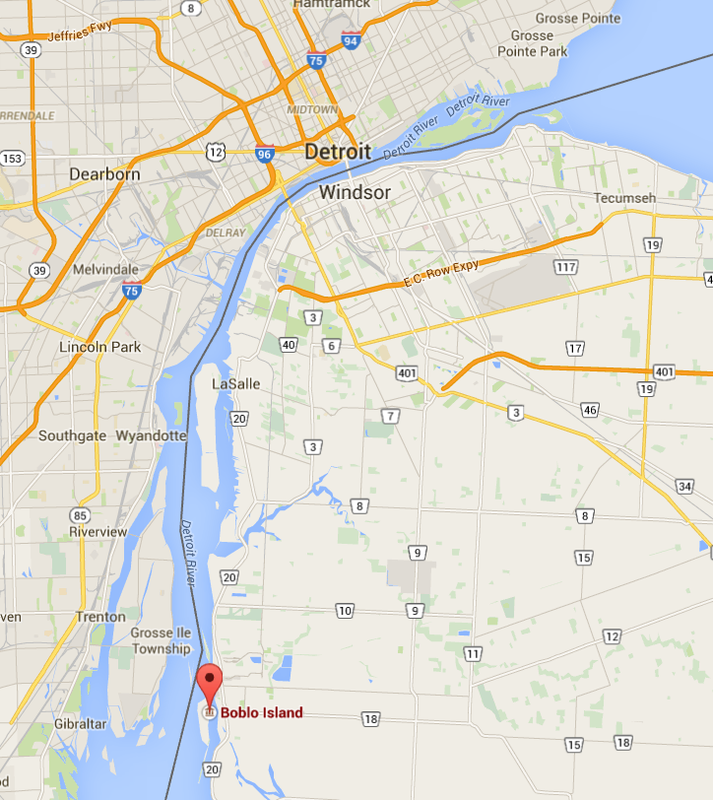 The red balloon is Boblo Island in the river between Detroit and Windsor, on the Canadian side. From the French Canadian Heritage Society of Michigan, we find the following important contributions to understanding early Indian slavery in the Detroit River region, an important trading area. Suzanne goes on to provide some additional information on the naming practices of the Hurons and Wendats. OF THE MISSION OF SAINT JOHN THE BAPTIST AMONG THE ARENDAENHRONON. In this Country, there are no Names appropriated to Families, as in Europe. The Children do not bear their Father’s name, and there is no name that is common to the whole Family,- each one has his own different name. Nevertheless, it is so arranged that, if possible, no Name is ever lost; on the contrary when one of the Family dies all the relatives assemble, and consult together as to which among them shall bear the name of the deceased, giving [page 165] his own to some other relative. He who takes new name also assumes the Duties connected with it, and thus he becomes Captain if the deceased had been one. This done, they dry their tears, and cease to weep for the deceased. In this manner, they place him among the number of the living, saying that he is resuscitated, and has come to life in the person of him who has received his name, and has [121 i.e. 119] rendered him immortal. Thus it happens that Captain never has any other name than that of his predecessor, as formerly in Egypt all the Kings bore the name of Ptolemy. The tradition of Native people changing their names at important times in their life is not restricted to the tribes near Detroit. One of the first records we have of Native people in what would become the United States is Sir Walter Raleigh’s Lost Colony on Roanoke Island in what is now North Carolina, beginning in 1584. The 1587 Colony itself may have eventually been “lost,” the but the journals of the first military expeditions to the island remain and those men record that one of the Native men changed his name from Wingina to Pemisipan. Search the links below for Native burial records transcribed by Gail Moreau-DesHarnais for the word “panis,” “mitis” and “sauvage” to find the Indian burials. L’Assomption-de-la-Pointe-de-Montréal-du-Detroit (Assumption in present-day Windsor, Ontario): Part 1 (1768 – 1784); Part 2 (1784 – 1792); Part 3 (1792 – 1800); Part 4 (1800 – 1805). Many of these panis were young or newborn children, so they were obviously being born to a panis mother and a father who could have been Native or not. In some cases, there is no name for the child or the mother, only the owner. In addition, the French Canadian Heritage Society provides a link to other Native American resources of the region. Another valuable link is this one to French Canadian and Native Families. In addition, there was a 1762 census of this region that includes information about Native people and slaves. I had asked Suzanne about an entry within the burial records that referred to “rivierre Panisse,” as a place name. I found the reference I wanted for the riviere de la panisse: Page 9 of Diane Sheppard’s article, Census and Land Records, shows the original Chaussegros de Léry Maps. In the first one, point M is identified as riviere de la panisse. This is approximately just south on the Ontario side of the current Ambassador Bridge that links Detroit and Windsor. The area near the Ontario side of the modern bridge was occupied by the Huron from 1748 on before they gifted the property to build Assumption Church. The University of Windsor is now there also. These Huron Petun who came to be called Wyandot had originally settled close to Fort Pontchartrain at the invitation of Cadillac, just downriver from it, on the North shore, until they moved to Isle aux Bois Blancs (Bob-lo Island) up to the point that the rebel Huron destroyed that settlement in 1747. The area on the USA side not far from the Ambassador Bridge had been occupied for many years by the Potawatomi, also invited to settle near Fort Pontchartrain. They also gifted that land to French Canadians. 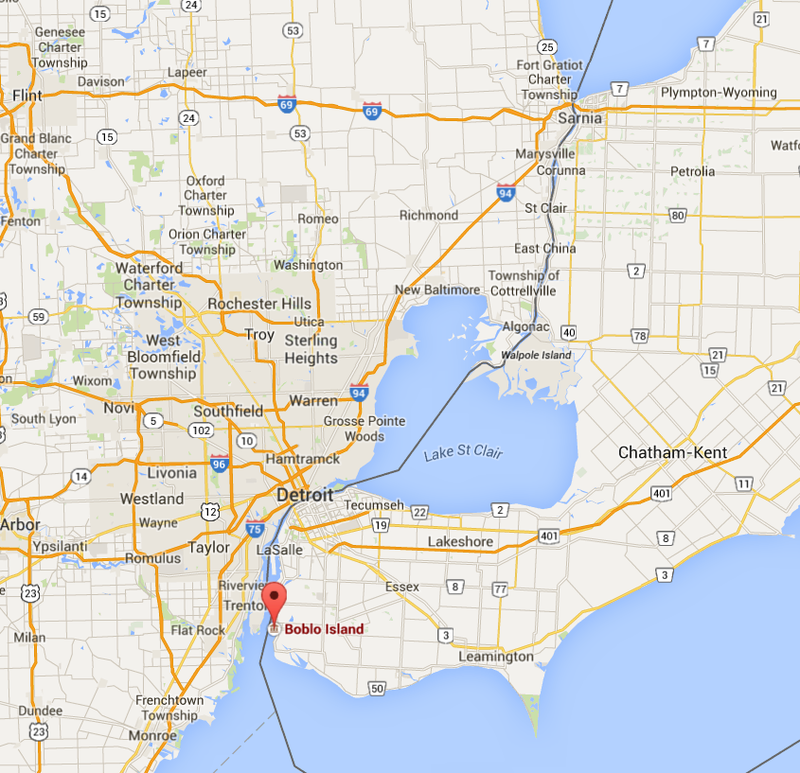 On the map below, the Ambassador bridge is the only surface link between Detroit and Windsor until you get to Port Huron, another hour north where a second bridge is located. Ste. Anne’s Church in Detroit sits at the foot of the Ambassador bridge on the Detroit side. I asked Suzanne about when slavery ended in this region. In the Louisiana region, slavery was not abolished until 1865, but the situation was entirely different in Canada where, by the 18th century, to the use of slaves was becoming increasingly infrequent. In 1793, Upper Canada (today, Ontario) legislated for the first time against the importation of slaves, thereby heralding the gradual elimination of slavery. The same year, Lower Canada (Quebec) also presented a bill to abolish slavery. Several members of the Legislative Assembly, themselves slave owners, opposed the legislation. Finally, it was the courts who sealed the fate of slavery in the province: in various cases concerning the arrest of slaves for having run away from the domicile of their master, judges ordered the liberation and manumission of the fugitives. In 1833, the official abolition of slavery in the British Empire simply confirmed the existing status that had already prevailed for several years in Canada. However, it is impossible to state with precision the date when slavery disappeared from the country. I want to thank Suzanne for answering many questions during the preparation of this article and so willingly sharing her years of expertise. This entry was posted in Huron, Panis, Potawatomi, Wyandot. Bookmark the permalink.